Which running surface is the hardest on your feet? Today we’re talking about which running surfaces are hardest on your feet. In episode #17 of the Doc On The Run Podcast we talked about how you can choose a running surface that will decrease the stress and strain on your foot. Mainly we were talking about how running uphill or downhill or along a side slope can be used to your advantage to either deliberately increase or decrease the stress to your foot and perhaps even an injured structure. Obviously if you can decrease the stress to an injured structure you can theoretically heal faster. The one component of running surfaces that we did not address in that episode was how hard a certain kind of surface can be on your feet. So today we’re going to talk about concrete, asphalt, grass, sand and all the different running surfaces. Because running surfaces aren’t all created equal. Some running surfaces are hard. Some are soft. Some are smooth and predictable and others are rough and irregular. Considering the different traits of the path you choose is important if you are hoping to avoid injury, or if you’re returning to running after an injury and you don’t want to get re-injured. If you look around your neighborhood, you will probably see asphalt streets but concrete sidewalks. According to the Federal Highway Administration about 796,000 miles of roads are asphalt and 158,000 miles are concrete. Concrete is the most commonly used building material in the world. In fact when it comes to general construction, concrete is used more than twice as much as all other building materials combined. However concrete is only used for a small percentage of roads and highways. If you live in an extremely hot climate like Texas or Florida you may find most of the roads where you live are concrete. Part of the reason for this is that concrete doesn’t melt in the heat. Concrete is an extremely hard surface. Of all the possible running surfaces concrete may be the least forgiving. So if you have a metatarsal stress fracture or some other type of injury that could use a little cushion concrete should be your very last choice. So if all of the roads in your neighborhood are made of concrete you might want to look for a jogging trail with a softer surface. Because of its color, asphalt is commonly referred to as “blacktop.” As I just mentioned, asphalt isn’t the best material for roads in extremely hot climates. When I lived in Texas I actually remember when one my friends parked his motorcycle on the asphalt in the middle of summer. The kickstand of the motorcycle just sank right into the hot asphalt and fell over. Given that asphalt heats up and get soft when the sun is blaring is a characteristic that can actually be used your advantage. On hot days, asphalt is actually relatively soft. But when it’s freezing cold outside asphalt will harden up and stiffen. So the hotter it is outside the softer the surface when you’re running on asphalt. That means that the hotter it is, the less stress on your foot when you land on the asphalt. If you like to run on the road the odds are good that you’re going to be running on asphalt. After all, most of the roads in United States are surfaced with asphalt. When it comes to running on paved streets, asphalt is probably your best choice. It’s smooth, it’s predictable and it’s relatively soft when compared to concrete, brick or cobblestone. Not all roads are paved. Nearly half of the roads in the United States are unpaved. If you live somewhere out in the countryside you may have dirt roads nearby where you can run. Dirt roads can make excellent running surfaces. If they are well maintained they’re relatively smooth so you don’t have to worry about abruptly accidentally pronating your foot on an angular surface. Packed dirt it is also very soft. That cushion can allow you to run many extra miles without accumulating so much stress that you get an overuse injury like a metatarsal stress fracture. If it’s possible to incorporate packed dirt running surfaces in your regular running routine it could significantly decrease the amount of force to your musculoskeletal system and certainly has the potential to lower your risk of an over training injury. Grass is one of the softest surfaces there is. Every time your foot lands on all of those leaves of grass they absorb force and cushion the blow to your feet and legs. Running on grass is one of the recommendations I often hear from coaches. Although there is some merit to the idea of running on a grass surface it also has risk. Those leaves of grass can conceal divots, ruts and gopher holes that could trip you up. I can’t even count how many runners I have seen who either sprained an ankle, sprained a tendon or fractured a metatarsal when they stepped on some hidden irregularity while running in the grass. The problem of course is that when grass is mowed it looks flat on top. And all of those potholes hide under the smooth grassy surface. So if you’re running along and you catch one of those hidden obstacles at just the right angle they can cause a serious injury. There are many fields in Golden Gate Park in San Francisco. Many of those fields hide the type of obstacles we just described. But there are some grassy surfaces where you don’t really have to be so concerned. Golf courses are so well-maintained that they have the potential to make perfect running surfaces. However almost every golf course that I have ever seen has specific signs prohibiting running. So if you go for a long run on your local golf course you might wind up and an entanglement with an angry greens keeper. Football fields and soccer fields are also relatively well-maintained and are less likely to have hidden obstacles than an unmaintained field that you might find in a park. But be warned, all it takes is an active gopher or mole to cause trouble and put you at risk of injury. I should probably begin this with a disclaimer. I love to run on trails. I think it’s one of the best ways to enjoy the outdoors. However, it can be dangerous. In fact, just a few weeks ago I was running on a treacherous trail in Hawaii and got a concussion and an injured knee. You don’t have to have some spectacular fall to get injured on a trail. Irregular trail surfaces have lots of roots and rocks and erosions that can lead to serious injury. When your foot lands on a rock, or the side of the large root, your foot can be forcibly pronated or supinated. Frankly your foot isn’t designed to land on its side. The forces are spread out better when your foot lands flat. So if you land on an angular surface that shoves your foot in one direction or another you could get a metatarsal fracture, peroneal tendinitis or an ankle ligament sprain. And in case you’re wondering, yes, I have actually seen patients who have sustained all of these injuries running trails. In most cases these injuries kept them out of training for weeks. To me personally, the rougher the trail the more fun. When I go running in Yosemite there’s a 10 mile run that I do around the base or Half Dome. It has some very rough and irregular areas. It seems no coincidence that those rugged areas also come with a great deal of solitude. When I hit the rough stuff, there are virtually no tourists at all. So I understand why you may want to run on rough trails in the backcountry. All I can say is proceed with caution. Keep your eyes on the trail and try to land on the flattest sections you can. Try to avoid landing on the rocks or any obstacles that could cause injury. There are really relatively few cobblestone streets in the United States. But a few years ago I was invited to lecture at a conference in Portugal. After I gave a lecture I put on my running shoes and took off. I had my cell phone in one hand and a guidebook in the other. I ran 13 miles around Lisbon to see all the sights. And I got to see everything I wanted to see in just a couple of hours. But there were lots of cobblestone streets. And although they have a similar hardness to concrete they seem to be a little more disruptive. If you land on the edge of the cobblestone it can really twist your foot in one direction with another. This can put a huge amount of force on your foot, and could lead to an injury. Having said that, there is actually an argument that this irregularity might decrease your risk of injury. Concrete is so hard and so flat that you’re landing with a large amount of force over and over in exactly the same way. Running on cobblestones varies the position in which your foot lands. So if the cobblestones are relatively uniform and relatively smooth it may be easier on your feet. A slight irregularity can decrease the overall stress to any given structure in your foot when you run. So in that way, cobblestone streets have the potential to decrease your risk of injury. Running on sand can be one of the best ways to build run specific fitness. Trying to push off with a surface that seems to fade away underneath you, can rapidly build strength. If you’ve ever tried it, you know that running on loose sand is a brutal workout. Many authors also seem to recommend sand for its capacity to diminish force when you land. And in that respect, sand can reduce your risk of the stress-related injury such is a metatarsal stress fracture. If you decide to run on sand you have to realize that all sand is not created equal. Even if you look at one specific beach you’ll notice that there are really several different types of surfaces on the beach. Closest to the water the sand is actually wet. If you’re running in the surf you have to drag your feet through the water and the sand is extremely soft because it’s completely infiltrated with water as the waves crash on the beach and wash the sand away. As you move a little bit higher up the beach you move onto the apron which is the hard packed sand after the tide is going out. It’s extremely smooth but it still has some water content which is relatively soft. Depending upon the beach it may be steeply sloped. But if it’s a very gentle slope this can make a great running surface. This part of the beach is usually slightly damp and relatively soft. If you walk in bare feet it will usually leave a perfect imprint of your foot and your toes. This tells you that the surface is relatively stable, but it is also cushioning. That is the ideal part of the beach for a run! But you have to keep in mind that you are running along a sloping surface. So if you run 10 miles in one direction you’re going to be pronating one foot and supinating the other foot for the entire distance. It’s actually much better to run one mile out and one mile back, alternating each direction to alter the forces. 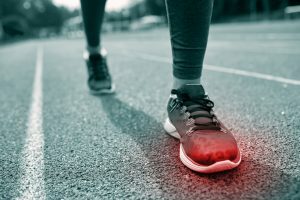 If you alter the slope every mile or so you’re less likely to get a pronated-related overuse injury like peroneal tendinitis or plantar fasciitis. When you get further away from the water you have dry loose sand. This is the sand in your kid’s sandbox. This stuff is very difficult to walk-through. Every time you take a step your foot slides one direction or another, and caves underneath you. If you look behind you at your footprints you don’t really see the perfect outline of your foot. You’re more likely to see an irregular hole in the sand where your foot slid around as you pushed off. Although you can run in loose sand you should expect a workout similar in effort to hill repeats. If you run for a long run in this type of sand you’re almost assured some sort of over-training injury. It’s just too loose and unstable to sustain long efforts. Running in snow can be magical. It can be exhilarating to go for a run in the middle of winter in a beautiful setting. But much like sand, there can be a lot of variability with snow. 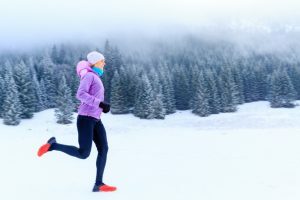 Hard packed snow that you might encounter on a snowy road can make a good running surface. If the temperature is right it may have some cushion when you land but enough stability that you can push off without slipping and sliding. When the temperature gets too low the snow can turn to rock-hard ice. This stuff can be just as hard as concrete. To make matters worse ice can obviously be “as slippery as ice.” Slip and fall on the ice and you might wind up in the emergency room with more than just a sprained ankle. As the snow begins to melt it becomes less stable. Slushy snow doesn’t make a great running surface because it’s too unstable. Much like dry, loose sand it will skate away underneath you and result in excessive pronation. All of that can add up to too much risk of injury. If you’re traveling and decide to go for run in the snow you have to be careful when you first take off on your adventure. You want to try to confirm that the surface is soft enough to absorb your impact but not so soft that you risk injury when you push off. If you walk in the snow and you can see no image of your running shoe treads in the snow is likely either icy or frozen hard as a rock. But if you’re walking in the snow and it leaves a shallow imprint that just allows you to identify the tread pattern on your running shoes it should be perfect. 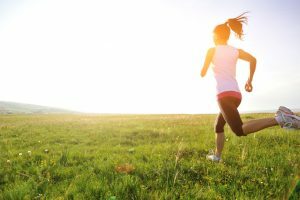 So although most running surfaces come with a balance of pluses and minuses there is really only one that has way more advantages than disadvantages. If you go to the stadium at your local high school or college you will most often times find a jogging track circling the football field. Those rubberized jogging tracks make the ideal running surface. They are smooth and flat with just enough cushions. Every time you land you mitigate the forces of gravity. These types of running tracks are soft enough that you can run in rock-hard track cleats without risking a metatarsal stress fracture. There are really only a couple of disadvantages with cushioned jogging tracks. One isn’t really a disadvantage but only a problem in terms of perception. Some brand-new freshly surfaced jogging tracks will feel super soft. If you’re doing a tempo run or mile repeats you may have a hard time staying on pace. I have run on tracks so soft it feels like I’m having to put out extra effort just to maintain my usual pace. This isn’t something you imagine. The fact is that the deformation of the rubber track caving underneath you when push off is absorbing energy. That energy would normally be used to propel you forward. So that’s why some runners feel like they’re running slightly slower on brand-new cushy running tracks. The second disadvantage with jogging tracks that they can be relatively boring. When I am ramping up in training, I do mile repeats on a track. Depending upon where I am in my progression I may be doing 10 or 12 miles on the track. That probably doesn’t seem like a long distance to you but if I’m doing 10 miles that’s 40 laps. 40 mind-numbing, soul sucking, tedious laps. No matter where you live you likely have several of these different surfaces to choose from. Of course, you don’t have to pick just one. I try to run on at least three different surfaces each week. I run on the road one day during the week. I run on the track for mile repeats on another day. I run on trails on the weekend. They say the variety is the spice of life. Variety may also be the spice of injury reduction. In the same way that cross training can spread out the forces across a number of different anatomic structures to reduce your risk of injury, altering the running surfaces so you can spread out the forces to your feet can help you stay healthy, run longer and recover faster. Choose your path wisely!